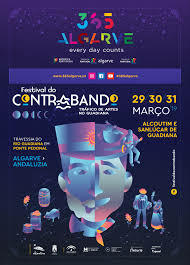 If you fancy a day out from Lagos Marina, the Contrabando festival is ideal.Plenty of entertainment, food and drink. It is held over three days, 29th, 30th and 31st March. It is held in Alcoutim and Sanlucar de Guadiana. A floating bridge is placed across the river so visitors can access both villages easily. The Festival do Contrabando - Festival of Smuggling, is an annual event which commemorates the history of 'smuggling' which took place between the people living on the Portuguese and the Spanish borders of the Guadiana river. Before Portugal was part of the European Union the Guadiana was a popular passage for smugglers. The Portuguese took coffee and sugar and traded it for fabrics from Spain. Smugglers transported the goods by swimming across the river between Alcoutim and Sanlúcar de Guadiana. Aside from the contraband that was exchanged, there was an exchange of arts and culture, which is also celebrated at the festival. This is a great weekend event for all the family, with plenty of live entertainment, food and drink.